Pacific Gas and Electric Company (PG&E) and Efficient Drivetrains Incorporated (EDI) unveiled two new utility trucks – a Class 5 utility work truck and Class 5 plug-in hybrid electric bucket truck – at an event held Sept. 17 at EDI’s manufacturing facility. Developed by EDI in partnership with PG&E, the utility trucks were designed, built and tested at EDI’s manufacturing plant in Dixon, Calif. The vehicles feature the “EDI Drive” PHEV system, which provides up to 30 miles of all-electric range and an additional 300 miles of range in PHEV mode. In addition, these vehicles are the industry’s first to also offer both parallel and series hybrid modes, allowing the vehicle to maximize fuel efficiency in both highway and in-city driving conditions, according to the companies. Aside from fuel savings, the Class 5 utility work truck model also offers up to 120kW of exportable power, which can be used to shorten or eliminate planned and unplanned outages. According to PG&E, nearly 80 percent of the transformers in its service area are 120kW or less. “These vehicles were custom designed to meet PG&E’s goals of both electrifying its utility fleet and to utilize that on-board generating capability to fundamentally change how the utility manages electric outages,” said Joerg Ferchau, chief executive officer for EDI. Kaufman demonstrates the Altec systems electric powered boom on the EDI/PG&E Class-5 Trouble Truck. 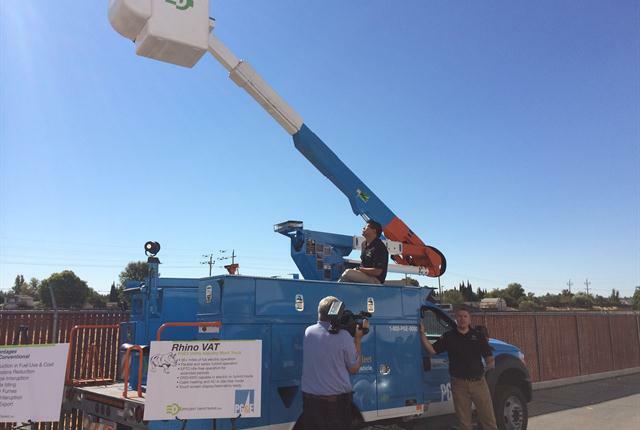 PG&E and EDI also unveiled a Class 5 PHEV bucket truck that they partnered on with Altec Industries, featuring a customized version of Altec’s Jobsite Energy Management System (JEMS). This technology allows crews to operate all onboard vehicle equipment, including the boom, climate control, lights and other auxiliary systems off of the onboard batteries, eliminating the need to idle the trucks while at jobsites. PG&E has been utilizing this technology on its Class 5 and Class 8 bucket trucks for nearly five years, and reported nearly $750,000 savings in fuel costs last year when compared to conventional bucket trucks. PG&E, one of the largest commercial fleets in the U.S., currently operates 942 Class 5 vehicles, including bucket trucks, flat beds, and other service trucks. If the utility were to replace all of those vehicles with EDI’s plug-in electric hybrid models, the utility estimated it would save nearly $3.5 million in fuel costs and reduce GHG emissions by over 9,000 metric tons annually. 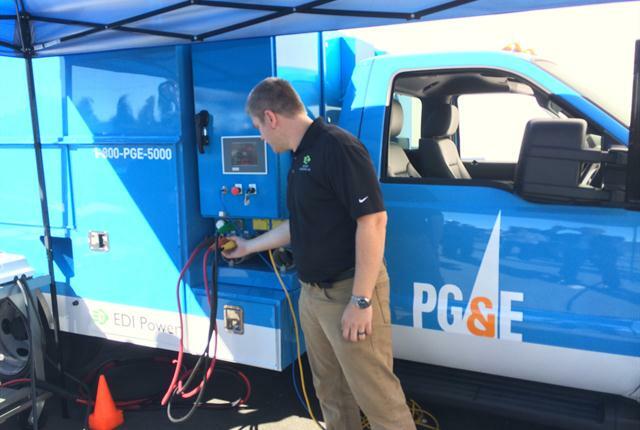 PG&E operates one of the greenest utility fleets in the industry, with nearly 3,500 alternative-fuel vehicles, including approximately 1,000 electric and electric hybrid units.